Most popular for office use! Hyundai Wacortec's Ultra filtration has a filtration pore size of 0.03 to 0.05 microns, that is between micro and nanofiltration. It is capable of removing bacteria, protozoa and some viruses from the water to provide clean and healthy drinking water.This method is most popular for use in water dispensers for offices and homes. 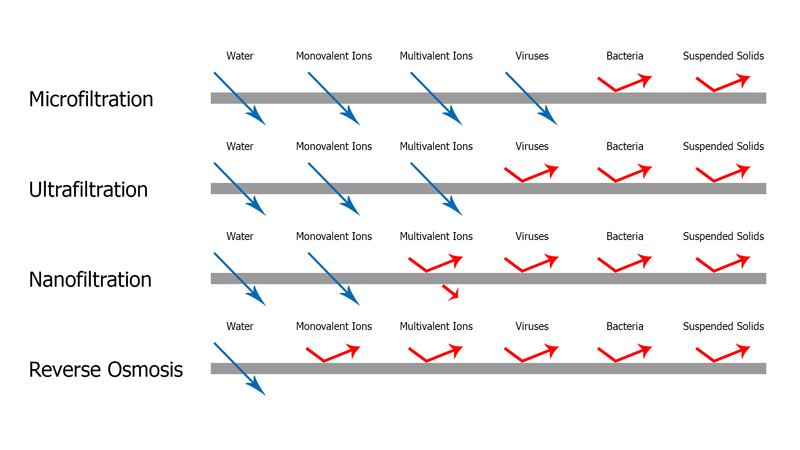 Reverse Osmosis has a filtration size of around 0.001 micron. Water treated by reverse osmosis is essentially pure water. It removes all dissolved substances, organic molecules, bacteria and viruses, most of minerals in water and desalinates water. Removes a wide range of impurities and substances including lead, copper, trihalomethanes, arsenic, giardia, cadmium, chlorine, pesticides, salt, sulfates, cysts, and nitrates. What can the filtration systems filter? Removes small particles. This stage removes dirt and other minute impurities, particles that are 15 times smaller than a grain of sand using a 1.5 micron high quality sediment filter. Removes chlorine & organic substances. This stage removes chlorine, trihalomethane and other organic substances. Enhances the fresh taste of water. This stage provides the natural taste of the water by removing dissolves gases and odors through a high quality granular activated bituminous filter.